Cooking healthy meals doesn't have to be a long, difficult process. Quick, simple meals, menus and snacks - from soup to dessert - can fit into any busy lifestyle. Let me recommend some of my favorite cookbooks, recipes and techniques, and favorite foods from avocado dip to zucchini bread. Get ready to explore new ideas and solutions to age-old problems like how to get your family to eat vegetables! Confession: I have to admit that many days I get so preoccupied with my online work, knitting, housekeeping, and gardening when 'tis the season, that I leave meal planning and prep to the last minute! What do I do? Head to this page for some ideas ;-) I welcome you to join me here! Need a Handy Cookbook for more Meal Ideas? - Something old, something new, all easy for you! I rarely have everything in a recipe but it hasn't cured my addiction for collecting cookbooks. Not only do they teach me about kitchen essentials that I need to purchase, but they offer fantastic pictures that encourage artful presentation and they often give menu plans that help my weary (by dinnertime!) mind. My partner thinks I'm a fabulous gourmet cook. Little does he know how much help I have! Shhh. Don't tell the kids what's in the soup. I love this book because it works. Kids will eat healthy when they don't know what's in what they already love. Cooking for a month means planning one day per month you can devote to cooking. With the right planning of freezer space, time, menus and shopping, cooking for a month can be a lifesaver, whether its during the busy holidays or the lazy summer days. FrugalMom.net has a very clear step-by-step approach to explaining how this works. It's important to have sufficient freezer space cleared out, all your freezing supplies on hand, and sufficient uninterrupted time. I don't know about you, but my special situation is that I live near the ocean, and every morning is cloudy or foggy. Sometimes it doesn't clear up until mid-afternoon, at which time everyone wants to head to the beach. Coming home at 7 or 8 pm means a very late dinner unless there is something ready to pop in the oven. Give this a try, you may fall in love with cooking for a month! Some kids won't eat certain foods because of the texture or the taste. The key to encouraging them to eat their least favorite foods is dips and sauces. We all know many kids who love macaroni and cheese. Hint: cheese dips and sauces can make anything yummy. Lightly steam vegies (carrots, cauliflower, broccoli, etc. ), just enough to make them easier to chew but not so much as to make them limp. Other "dippables" - celery, squash, mushrooms, and peppers. Try fruit too: apples and pears work well, but try everything. Peanut butter makes a great fruit dip. Other sauces and dips to try: black bean, guacamole, tofu, cream cheese, or sour cream. 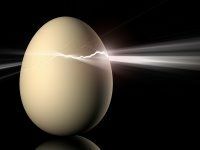 We can be sensitive to certain foods and not even realize it! We may feel tired, not have any motivation, or feel very uninspired and not know why. The most common food sensitivities and allergies are to dairy and wheat. I've found a lovely blog written by the mother of a three year old, called The Mommy Chef. She includes some alternative snacks for kids that include different grains other than wheat and, of course, emphasizing whole grains. 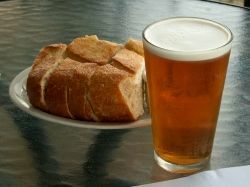 You can follow her advice for using a variety of "bread" options, like tortillas, whole wheat bread, etc. and expand even further, to rye and other grains. Of course, fruit and vegetable snacks are yummy and nutritious too. I'm including one of her recipes and I suggest a flourless variation that she mentioned for those with sensitivities to wheat - Ezekiel bread. Ezekiel bread is a flourless bread made from sprouted organic grains, slightly sweet and absolutely delicious. I've made pizzas like this before using rye crackers, tortillas and so many other kinds of breads, try them all! You can even substitute soy cheese for the provolone, if dairy products are your sensitivity. What kid doesn't love pizza? Well, I have yet to meet one that doesn't inhale it, so I came up with a quick and easy version that my son enjoys for lunch from time to time. I also serve them on game days and for a quick week night dinner with a green salad. Experiment with different toppings like pineapple, peppers, mushrooms, lean ham, etc to let your child come up with their own unique and healthful alternative to the regular pizza delivery. Pita bread(We like The Alternative Pita Bread whole wheat pitas I buy at Sprouts). Start the broiler. 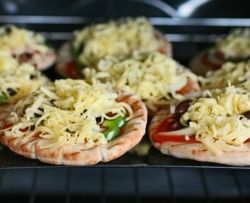 Place pitas on a baking sheet and put a generous amount of sauce on the pita and spread leaving a 1/4 inch at the edge. Top with veggies,herbs, ham, etc and then layer on a small amount of cheese(doing it this way keeps the veggies from getting picked off...just dice them small). Broil for a few minutes until the edges of the crust start to brown and the cheese is melted and bubbly. Cool for a couple of minutes and cut into triangles! Yummy...and simple! *Hint: I sometimes add pureed carrots or spinach to my marinara sauce to add a little more nutrition. This way my son gets what he needs without objecting to it! To puree, just steam or boil your veggies(steaming is better because it preserves the nutrients) and puree until smooth. You may need to add a little of the cooking liquid to work out the lumps. You can freeze the rest in 1/2 cup increments for later use. It's so important to introduce new foods to children in ways that will encourage good eating habits. Babies don't come with instruction manuals, so the right cookbook can empower mothers to raise healthy children. One thing many cooks and cookbooks don't pay attention to is how small children develop food texture preferences. This can make it difficult to transition from pureed to more solid foods. Annabel Karmel notices this and helps young children make that transition. Brilliant! Blend all ingredients until thick and creamy. The addition of the oatmeal fiber and walnuts helps to lower cholesterol, as does using yogurt or a yogurt drink fortified with sterols or stanols from plant sources. 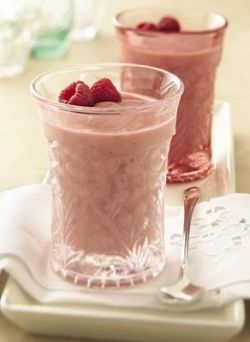 If what you want out of your blender is mostly just breakfast smoothies, as I do, then this may be the blender for you. It even doubles as a travel cup when you have to drink it on the way to work. How cool is that?! I don't recommend the lemon juice diet, which consists of a 2-week diet of drinking only a lemon beverage prepared from lemon juice, maple syrup, water, salt, and pepper. While lemons are high in vitamins A, B, and C plus amino acids, calcium, citric acid, copper, magnesium, phosphorus, potassium, sugar, they contain no calories, fats, fiber, or protein. Lemon juice is a great addition to any detox diet because it helps loosen bowel movements and is very beneficial to the liver. Including lemon juice in your daily regime can only benefit your health and well-being, especially if you've developed unhealthy eating habits, lead a sedentary lifestyle, and/or suffer from depression. As always, if you have pre-existing conditions, run any major dietary change past your physician, especially if these include allergies, ulcers, or hyper acidity. Herbs to help prevent osteoporosis include dill, basil, and cloves; foods to aid the defense against osteoporosis include cheese, beans and lentils, lean meats, and green leafy vegetables. A fantastic vegetarian meal is savory bean burgers. Top that burger with some fresh spinach or lettuce and some basil pesto. Yum! Not a vegan? Melt some cheese on the top of these for a yummy variation. Follow that link for a complete list of all the foods that contain the above vitamins and minerals in enough quantity to strengthen your bones. Bon appetit! It's blackberry season here in the Pacific Northwest; my favorite cereal with the addition of super fresh berries (picked right outside my door) is a fabulous way to start the day! 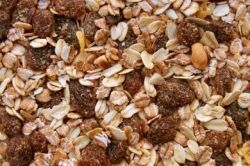 Mix oats, apple, raisins or figs, and almonds or sunflower seeds together. If desired, you may pulse this in a high speed blender a few times, I prefer stirred. Add yogurt or milk, cream or hemp or almond milk and top with blackberries. Serves 2. Variations: use whatever fruit you have on hand, and maybe sprinkle in a little cinnamon or nutmeg. Use any sort of flaked grain cereal, vary the nuts...and use different colors to make it appealing and attractive! Raspberries, blueberries, cranberries, hazelnuts, yum! Casseroles are one of a variety of one-dish meals that include soups, stews, lasagna, oven roasts and stock pot meals. 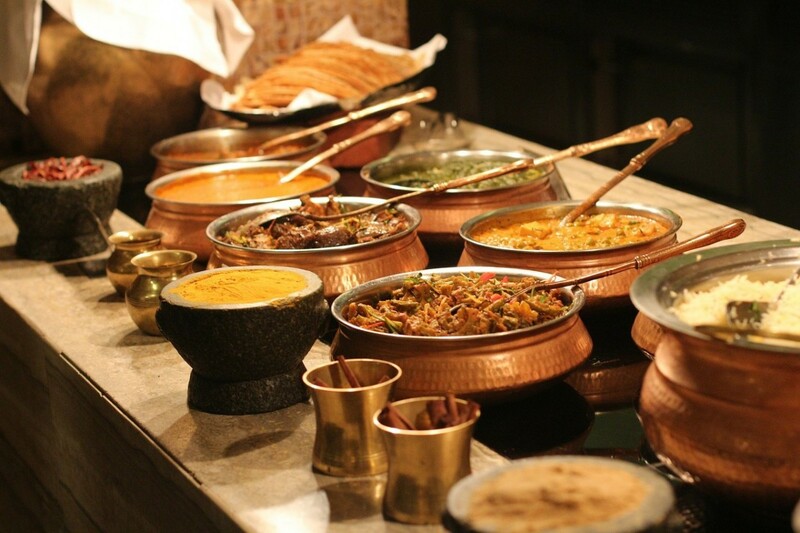 I love to cook but often choose one dish meals for their simplicity. Breakfast should by rights be the biggest meal of the day, because it gets the metabolism going and gives you tons of energy to start your day. If you're not a morning person and tend to just grab a cup of coffee and a doughnut, a breakfast casserole could be the answer. You can make this casserole for dinner the night before and warm up the leftovers for breakfast, or assemble it the night before, chill it in the refrigerator, then bake it for an hour in the morning. Maybe the best thing about this recipe is that you can use leftover meat, fish, or vegetables you have ready to add. Leftovers are also delicious served up cold. 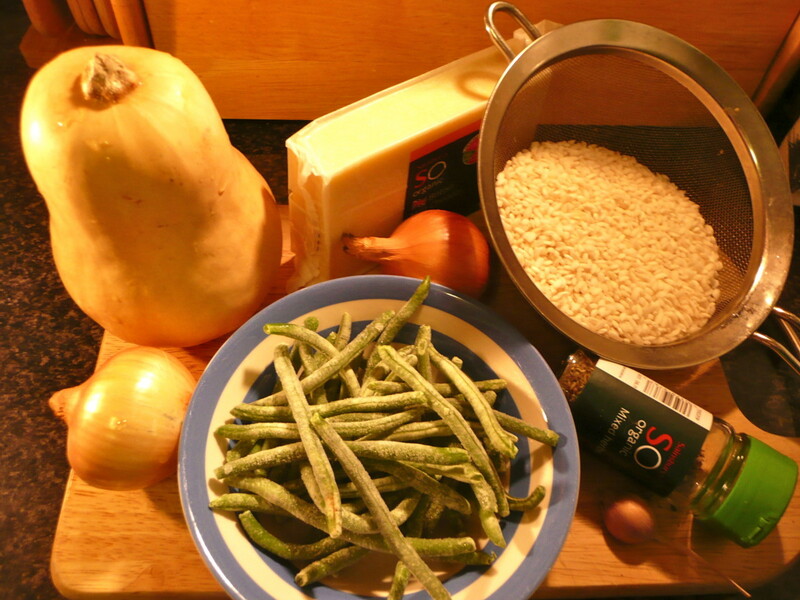 Let's start with the basic recipe for a busy cook. I almost never use this recipe as-is; I'll also include my favorite substitutions. Line the bottom of a 13x9 inch baking dish with the rolls, leaving them flat - don't roll them into crescents. Seal the "seams". Cover this with your meat, vegetables, and basil, and half the cheese. Whisk the eggs and the soup and pour over the casserole. Sprinkle the remaining cheese on top (sprinkling some Parmesan on top if you like, too). Now for the substitutions. I like to substitute whole wheat flatbread (tortillas) for the crescent rolls, omit the bacon or only use a little for flavoring, and really spice it up with either sage, oregano and fresh garlic - or - chili powder, garlic, oregano and cumin. Give me LOTS of chopped spinach too! Smoked provolone is my favorite cheese, but sometimes I'll use feta instead, with the original, milder seasonings. And I prefer cream of mushroom soup to cream of onion. Switch it up and make it a family favorite! Add a few of these variations to your shopping list and be able to make a wide variety of delicious breakfasts, lunches, suppers or snacks. 1. 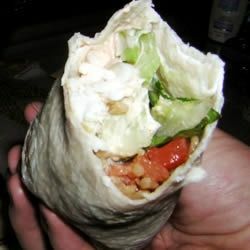 The wrap itself: Choose from corn, whole wheat, or seasoned (basil, pepper, dried tomato, cheese, etc.) tortillas or other flatbread. On a low carb diet? Use lettuce instead! 2. Vegies: Add parsley, cilantro, chives, cucumbers, radishes, sprouts, avocados, or spring garden mixed greens to add color and variety of flavors. Think beyond simply lettuce! 3. 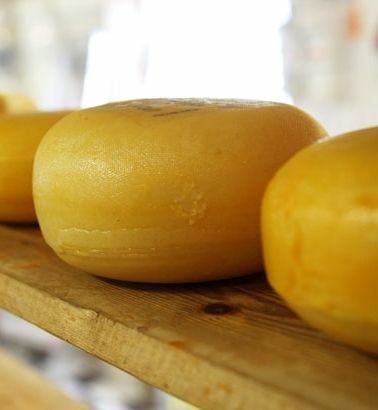 Cheeses: Instead of the more common cheddar, jack or american cheese, try smoked provolone, brie, swiss, cream cheese, sour cream, or feta for a new flavor sensation. 4. Condiments: Mayonnaise, mustard, and ketchup are traditional American fare, but why not try soy sauce, salsa, peanut sauce, teriyaki sauce, or Worcestershire sauce for a delicious change. 5. 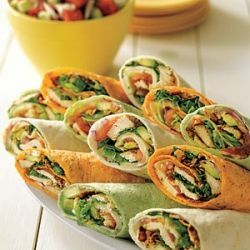 Meats: Leftovers are a great addition to any wrap. Especially yummy are barbeques and mixtures, ham and chicken being one of my favorites. Super simple soup: simply saute onion, add chicken broth and a few other ingredients, spoon over chicken, cabbage and avocado, and add garnishes. Voila, dinner is ready in 15minutes. Add a salad, bread, or dessert as desired. Click for the complete recipe. bread recipe so simple, a 4-yr-old made it! Homemade bread is hands-down my favorite food for so many reasons! First of all, I feel so connected to people throughout history, it's like I'm carrying on a sacred tradition. Secondly, the smell of bread baking gives me a glimpse of Nirvana. It is decidedly heavenly, which makes me feel like a kitchen goddess blessing my home. Thirdly, the taste. You have to let it cool or you'll squish it flat as you try to slice it. However, a thick slice of slightly warm bread cut carefully off the end and smeared with butter is almost psychedelic. And lastly - this recipe. You barely have to even stir it, then let it rise in a warm place for 20, yes TWENTY, hours. Mine is rising in the oven now, after resting there overnight. Two more hours and I'll continue. Not a bit of kneading is necessary. This is my second time baking this bread. Not only is all of the above true, but skeptical me is now convinced that this recipe works. I never knew I could make bread this delicious and so easily too. I feel like I cheated but I don't care. TRY IT, you'll become addicted too! Click here for the recipe: No-Knead Bread from Steamy Kitchen. The story and pictures that go along with the recipe are the sweetest thing I've read in a long time. Simple Healthy Salad Recipe for College Students - for those who left home without learning how to prepare a meal! You've moved out, you're living in a college dorm or in your own apartment and suddenly realize you miss your mom's good cooking. Why didn't you bother to learn? Now what? Here is a recipe for a Greek salad that not only tells you what ingredients to use, but gives you lots of tips on how to prepare the salad quickly and with good hygiene as well! Once you get the basic idea, you can turn this into a pasta salad, chef's salad, or any kind of salad you want, depending on what you like. Fast, easy and healthy! Sometimes I'm too tired to cook. Other times I'm so busy and in a hurry I just want to eat, not cook! Other times I've been being creative with my writing all day and I want something hassle-free but nourishing. When we're hurried, under stress, or tired, we need simple but nutrient-rich food that recharges us fast. This is a great reason to have some no-cook recipes on hand. 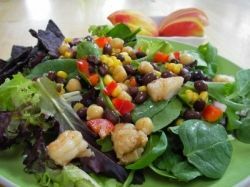 The following is a nutritious seafood and bean salad recipe that can be served alone, with garlic bread, or wrapped up inside a whole wheat tortilla. Ready in minutes, delicious, and great brain food as well! * 2 (16 ounce) packages frozen cooked shrimp, or substitute canned salmon or tuna, etc. Thaw out pesto if frozen. Defrost the shrimp by placing in a colander under cold running water a few minutes. Remove tails from shrimp if necessary. Combine the pesto and yogurt in a large mixing bowl. Drain beans and rinse, drain again. Add to pesto mixture along with seafood and remaining ingredients. Stir gently to coat. Serve immediately or cover and chill for up to 2 days. Sometimes I make this salad with an olive oil - lemon juice drizzle instead of using yogurt. I love leftovers, that's why I make such a big batch of this salad. I make it unseasoned as above, then add salt, pepper, garlic powder, cilantro, etc. to mix up the taste on consecutive days. I can't seem to make it last more than two days, however - it's that yummy! I have a confession to make: I'm already getting a little weary of salads, so I'll be researching some new ideas to change them up a bit. Meanwhile, I fall back on my old favorite, fajitas! 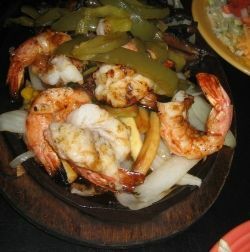 I made shrimp fajitas the other night - yum! You can substitute chicken, beef, pork - whatever you have on hand. The same goes for the vegetables. All wrapped up in warm corn tortillas. Mmmmmm. I simply sauteed some onions and garlic lightly for about 4 minutes, added some mushrooms and shrimp and cooked until the shrimp were pink, dropped in some green and red peppers at the last minute. That's it! 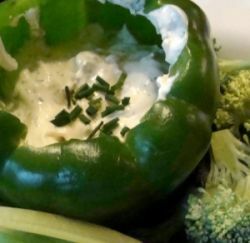 I love dips and vegies; add some sliced cheese and maybe a piece of fruit and you get a nutritional and super easy snack. Whether you use a food processor as in this recipe, or simple chop the cucumber with a knife (my preference), this simple healthy recipe can be whipped up in two minutes. Spend a couple more minutes preparing the vegies and that's it, done! I thought I made this up and then found a recipe online. Oh well...maybe they're mind readers? 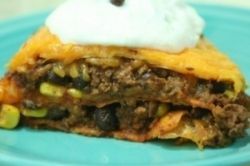 It's easy to make, like burritos in layers in a baking dish, and you can substitute/add anything you want. Like all casseroles, it's a great use for leftovers. Brown the chicken, onion, garlic, peppers, corn, and herbs in a frying pan. Set aside. Oil a baking dish and put a thin layer of hot sauce on the bottom, then a layer of tortillas, then beans, chicken mixture, spinach, more hot sauce, cheese, and repeat at least one more time, ending with cheese on top. Bake at 425 for about 15 minutes. Your favorite pasta, fresh herbs and vegetables, mushroom wine sauce, and smokey cheese, yum! 1. Bring 8 quarts of water to a boil. Cook pasta for 4 minutes, half of the recommended cooking time for whatever pasta you choose. Add cabbage and continue cooking, stirring occasionally, until the pasta and cabbage are tender, about 4 minutes more. Reserve 1/2 cup of the cooking liquid and drain the pasta and cabbage. 2. Meanwhile, heat oil in a large skillet over medium heat. Add mushrooms, onion and garlic and cook, stirring often, until the mushrooms are tender and beginning to release their liquid, about 5 minutes. 3. Whisk wine and flour in a small bowl. Add to the pan along with salt and pepper; cook, stirring, until the mixture thickens, about 1 minute. Add tomatoes and cook until just beginning to break down, about 1 minute more. 4. Return the pasta and cabbage to the pot. Add the mushroom sauce, the reserved cooking liquid, cheese and sage; gently toss to combine. 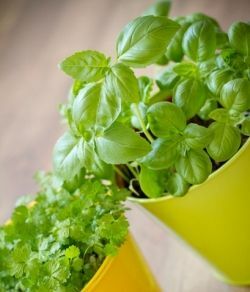 Add or substitute herbs in season: fresh chives, parsley, basil, cilantro, maybe even a touch of mint, whatever is growing on your windowsill or doorstep! Serve this with grated romano cheese, garlic bread and a fresh green salad. All prepared in less than an hour and deliciously fresh! 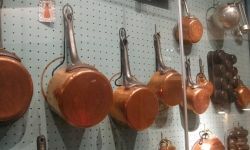 The picture is of Julia Child's pots and pans, immortalized in the Smithsonian for all time. She believed in keeping the most used kitchen items out in the open, close at hand, and hung her pots and pans on a pegboard with the shapes drawn on it for easily putting them back in place after washing. With a place for everything and everything in its place, the cook can find what she's looking for quickly every time, making healthy meal prep just that much easier. Read more about how to organize your kitchen like a programmer. 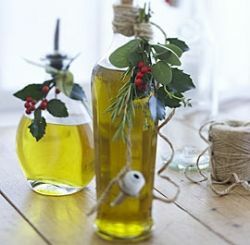 Making your own infused oils is easy and much less expensive than buying them, and they turn an ordinary meal into something special. You can brush them on your meat or fish as it grills, drizzle them over salads, or dip your bread into them. Olive oil is a great heart healthy choice because it is a monounsaturated fat that can decrease your chances of heart attack; virgin or extra virgin olive oils also have the greatest amounts of antioxidants, helping you stay youthful and heart healthy as well. Some popular herbs, fruits, and vegetables to use include dried tomato, orange, lime, lemon, basil, red chili, garlic, peppercorn, rosemary, tarragon, thyme, etc. If possible, use dry ingredients, such as garlic granules, dried herbs, and dried tomatoes, because it is the moisture in these foods that can encourage botulism. If you do use fresh ingredients, take them out of the oil after infusing or refrigerate the oil and use it within one week. Green salads, pasta salads, steamed or broiled vegetables all become a delightful treat with the addition of these delicious oils. Dip your french bread into garlic olive oil and you're transported to Tuscany; orange olive oil adds a touch of sweetness to green salads; lime olive oil gives your chicken fajitas an authentic Mexican touch - experiment and enjoy! Whether I'm staying at home, camping, or renting a vacation bungalow, this cookbook will be by my side. Why? Because I love preparing food, but in the summer I'd rather be outside gardening, beachcombing, hiking, swimming, sunbathing while reading or knitting. When I'm hungry, I want something simple and no-fuss. And when I'm packing for a trip, I agonize over how to plan and pack for meals. This cookbook does it all for me, except the actual preparation. With this book in hand, I know what I can prepare in advance and take along that will make gourmet meal prep fast and easy; how to stock my pantry; how to accommodate whatever appliances are or aren't available in my rental; and how to turn leftovers into gourmet picnic lunches. Don't let the "g" word fool you; all it takes is planning and you too can become a gourmet chef. And it doesn't mean missing out on any of the vacation fun. 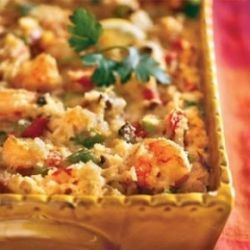 Casseroles are usually winter fare, as many summertime cooks don't like to heat up their houses with their ovens. When I lived in a hot summer climate, I would either stay up late or get up early to beat the heat and bake. This recipe could be put together the night before and baked early in the morning, or whatever works for you. In my current NW maritime climate, it's cool enough in the evenings even in the summer to bake up this scrumptious entree. I have to give props to Chef John for the original recipe. I changed it up enough, to fit what I had on hand plus my own tastes plus cooking for only two people, that I've written up my own version here. Enjoy -- we sure did! Take note: you may want to heed Chef John's advice to use a meat thermometer to determine when your chicken is done. I did not - my recipe used 2 chicken breasts not 6, I sliced them in half before cooking, and the casserole was a deep dark golden brown when I decided it was done. Sadly, I did not take a photo of this delicious meal (it was so gorgeous, I'm kicking myself now) and we ate every last morsel, even scraping the pan for the last bit of sauce. Mmmmm. Preheat oven at 350 degrees. Sprinkle salt and pepper over your chicken breasts. I halved them but you may want to keep them whole. I heated up a frying pan with 1 T olive oil and seared the chicken breast halves on both sides. Take them off the heat and let them cool a bit while you chop or crush the garlic ( I usually use Roja garlic which requires extra prep time because it is so tight-skinned and therefore difficult to peel! but oh so flavorful) and assemble the rest of your ingredients on the counter. Spread 1T oil, 1/2 t of pesto, garlic, and cayenne to taste in the bottom of your baking dish, arrange the chicken breasts, then spread the chicken with the rest of the pesto and sprinkle on the oregano. Spoon on the marinara sauce and spread to cover the chicken, then add half of each of the cheeses, the croutons, and the rest of the cheeses. Bake for 30 - 40 minutes. I baked mine for 40 minutes and the cheeses were so brown, I might try 35 minutes next time. By cutting the breasts in half and searing them, they were almost cooked enough before I placed them in the oven. Variations: if you are serving this dish with pasta, you might want to add more sauce. When using whole chicken breasts, you may need to bake for 45 minutes. 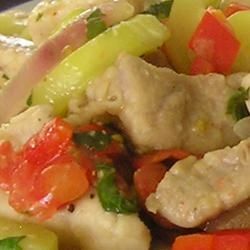 If it is too hot to cook, omit the searing of the chicken -- that is simply for added flavor, especially if you deglaze your pan by adding a bit of water, scraping up all the bits of chicken etc., and pouring over the chicken before adding the rest of the ingredients, you get even more flavor. However, if all the cooking you have to do is 30-40 minutes of baking, that is simple enough for any summer dinner. I served this up with a Greek salad consisting of cucumbers, olives, green onions, lettuce, feta cheese, and bell pepper - and some No-Knead Bread (http://www.squidoo.com/simple-healthy-recipes#module158348564), homemade the day before. Add a salad and maybe some homemade bread for a quick and easy healthy dinner. I've never thought of stuffing a chicken with vegetables and herbs, what a great idea. I'm making this dinner tonight! Shish kabobs are great for a family with picky eaters - you can assemble kabobs for even the most discriminating palate. Shish kabobs can be made with shrimp, beef, pork, poultry, etc. and any assortment of vegies, and portions are easily adjusted also. One kabob for the smallest in the family, several for the biggest. The most delicious results can be experienced by marinating the meat or fish ahead of time, but even that much preparation can be skipped. An easy marinade is your favorite oil and vinegar salad dressing. Simply fire up your grill, cut up your ingredients into chunky pieces (small vegies can be skewered whole, such as baby onions, mushrooms, cherry tomatoes, new potatoes, etc.) and skewer them. Brush with marinade or bbq sauce while cooking, and cook for about 15 minutes or until done. Serve on a bed of rice or with a green, potato, or pasta salad. I can never follow a recipe exactly because I don't plan ahead. I rarely have all the ingredients. This recipe was a fine example. 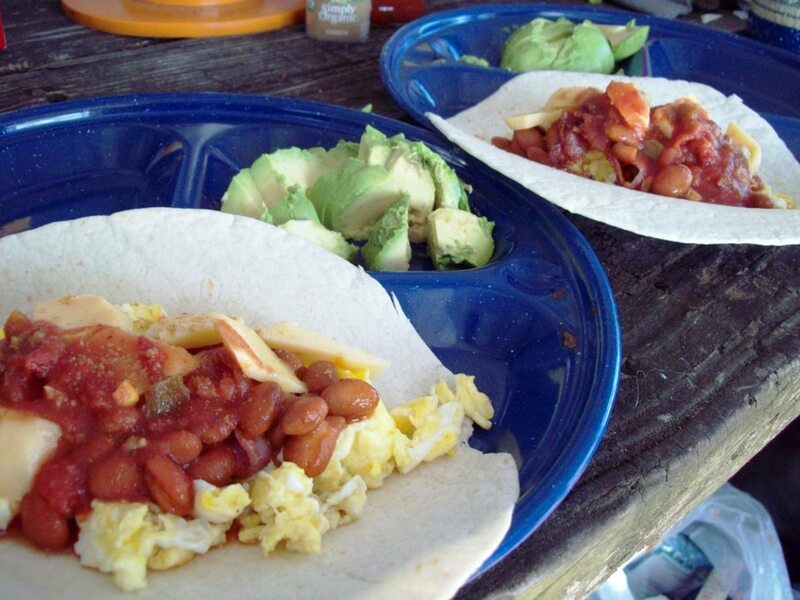 The basic idea is to marinate some fish, bake or bbq it, then wrap it up in a tortilla with whatever you have. The secret is in the marinade. Fill it with whatever you have that tastes good to you. Here is what I substituted - cod for tilapia, lemon for lime, wine vinegar for white vinegar. Then, I didn't have sour cream and I didn't have adobo sauce. I substituted mayonnaise and my own combination of tomatoes, garlic, onion, enchilada sauce, and Tabasco. Go figure. I just started grabbing things out of the fridge until it tasted yummy. You could try whatever is in your fridge - ketchup, you name it. Here's the link to the complete recipe. Oh - I marinated the fish for only 4 hours, and baked it in the oven. Times are tough economically, and one place we can economize is with our food purchases and preparation. 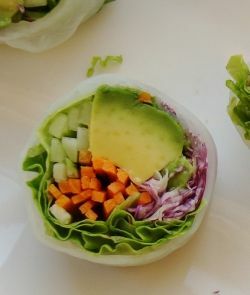 What foods you choose and how you prepare them makes all the difference when you want to eat healthy on a tight budget. This recipe works with any kind of fish, fresh or frozen. You'll feed two people on one piece or portion of fish, some leftovers, and whatever else you may have around. I used cod and leftover mashed potatoes, but I wrote the recipe as if I cooked the potatoes fresh. Be creative! Boil the potatoes until soft, then boil the cod in the same water until it flakes apart. Meanwhile mash the potatoes. Mix together the fish and all the other ingredients. Heat a large skillet to medium temperature and add the oil. When your skillet is hot (mine takes a few minutes to heat up) form the fish mixture into patties and cook until well browned on each side (about 5 minutes per side). For the cooking oil, I use 1T olive and 1T sesame oil - both combine for a rich, nutty flavor. 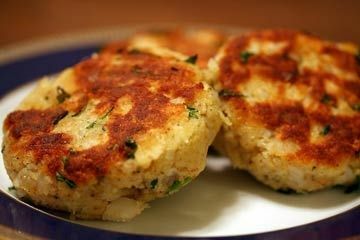 I serve these fish cakes with bread and a salad for a complete meal. Healthy, inexpensive, and delicious. My significant other always says, make these again please. ~ I like to spice this up by doubling the chili powder and cumin, also adding 4 or more cloves of garlic and half an onion. Serve with a dollop of sour cream on top, and add a fresh salad and some quesadillas if you want. Yum! 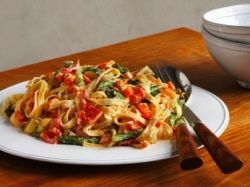 Thanks to AllRecipes.com for the recipe and check out their 6 Healthiest Recipes in History. You went overboard at last night's holiday dinner. How do you undo the damage and how do you plan that "ounce of prevention"? Undo the damage: Don't starve yourself to try to make up for pigging out. Next morning, start with a high-fiber breakfast, followed by a brisk workout and lots of water. Then, throughout the day, eat foods that are high in potassium (apricots, bananas, pumpkin - to flush out excess water) and those that contain plenty of water (melons, cucumbers, celery). Stay away from salty foods and carbonated drinks. An ounce of prevention: Oh the inevitable potluck dinner - this is your chance to bring something healthy and lots of it so you can eat lots, guilt-free. Forego the gravies, cream sauces, breads, and eat double helpings of salads (with oil and vinegar dressing) and vegetables. When you're the hostess, fix lighter foods, and send everyone home with doggy bags of leftovers. Winter is a time of indulgent holiday eating and the resulting digestion problems, cold and flu season, and sore throats. Why not ward off the winter blahs with soothing, healthy tea? If you are using licorice root in powder or ground form, 1 licorice root. 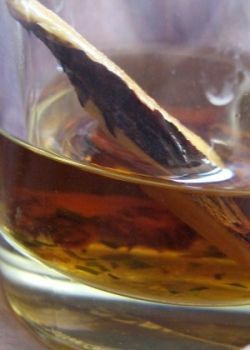 If you have licorice root slices, add 2-3 slices directly to each steeping cup, rather than to the tea blend. Store in a dark colored glass jar in a cool place. Learn how to prepare tea by the cup or by the pot at Rhythm of the Home. As for prep time - the rice takes approximately 40 minutes to cook so if you're an efficient cook, you could whip this meal up in 40 minutes. I added 10 minutes for us multi-taskers. I'm usually working online while cooking. I kept the rice on 'warm' while whipping up the stir fry. 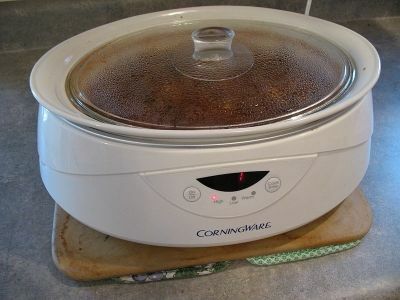 Bring water to a boil and add rice, stir, cover, and immediate turn down heat to low. Heat 1T of the oil to high heat and quickly fry the tortillas one at a time, turning them once to brown/crisp both sides. Place on paper towels to drain. Heat 1T of oil in a large skillet and brown the pork. We buy our meat in large packages at Costco and I took one very thick piece of pork out of the freezer, I'm assuming that one would call it a boneless pork chop. This amount of meat is sufficient for two adults with medium appetites; a hungry teenager or husband might require more. Remove the pork with a slotted spoon or spatula to a platter and cover to keep warm. Add your frozen broccoli (or other green vegetable) to the skillet and saute quickly at high heat for one minute. Push it to the sides of the skillet, add 1-2T more oil and saute onion, garlic, celery and herbs for another minute then stir broccoli back in and cook them together for another minute. Add the tomatoes and stir til all are heated through. I broke up two tortillas and placed them on a plate, added the rice on top of that, and put the stir fry on top of that. The crunchy tortillas really made the meal. You could substitute corn chips but I preferred it without the added salt. I like to sprinkle gomasio (sesame salt made with sea salt and sesame seeds toasted and then ground up together) on top. I guess that makes this a Mexi-Italian-Japanese dish. Yummy. I would probably add more onion and garlic the next time I make this, as I like stronger flavors. 1. Always sear the meat AND the vegetables, and add half of the seasonings in the last 30 minutes. Slow cooking can make everything bland, and I like herbalicious meals! Every time you lift the lid, you lose enough heat to need to add 20 minutes to the cooking. Therefore, wait til 10 more minutes is needed, then add the herbs and cook for 20-30 minutes. 2. Don't add too much liquid, as the liquid doesn't boil off and the food itself releases juices. 3. Fill the cooker only 1/2 to 3/4 full. Lower and it will cook too fast, higher and it won't cook thoroughly. 5. Use trimmer cuts of meat - fatty foods add a weird texture and cook too fast. 6. Put vegies in first, meat last, since vegies need longer to cook. 7. If you want food to be ready in about 8-10 hours, use low heat; in 4-6 hours, use high heat. herbs to taste - basil thyme oregano rosemary or ? Heat the oil in a skillet while you apply salt and pepper liberally to each side of the roast. Sprinkle generously with flour and pat until it sticks. Shake off excess and then brown for several minutes on each side. Remove meat to a plate and add mushrooms, onions, garlic, and butter to the pan. Brown (about 3-5 minutes) while stirring. Add flour and stir for 2 more minutes, then add broth. I save meat bones and vegetable scraps in my freezer and make my own broth. A quart size freezer bag of scraps added to 3c of water and brought to a boil, then simmered for 10 minutes, makes a tasty, free broth. Place the carrots and celery in the bottom of the slow cooker, add the meat, and pour the contents of the mushroom/onion mixture. Add your herbs and cover tightly. Cook for the desired length of time. If I'm cooking with a T of each herb (dried), I add 1/2T of each at the beginning and then the rest 30 minutes before serving. I check the "gravy" in the pot and if I'd like it thicker, I cook the last 30 minutes on high heat, the last 20 minutes with the lid off. * If you like your onions, garlic and mushrooms to be more flavorful, take them out of the skillet and put them in a bowl, leaving as much of the juices/butter behind in the skillet as possible. Then make your gravy, fill the crock pot, and keep out the mushroom mixture until the last 30 minutes of cooking. Add with the last-minute herbs and cook uncovered. Excellent lens, solved half of my problem. lately i was having food from homedeliverydiet. org/. but now that i have left my job, i have time to make better use of these recipes you shared. thanks a lot. I sure could use one of these recipes! Great recipes, sounds delicious! Thanks for sharing! Lot of good recipes and tips here. 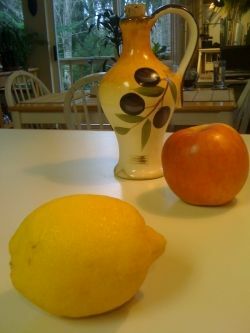 I never knew there were so much valuable vitamins in lemons, bit too much acid in them for my old stomach now, but I used to have lots of lemon drinks, especially in the winter. Thanks for sharing, will try some of those healthy recipes. @TapIn2U: Mmm sundae...and thanks for the yummy comment too. I'm glad you've enjoyed what I shared. Is there anything you'd like to see here that isn't on my menu? @Doc_Holliday: Thanks Doc!. I'll be adding new recipes from time to time so keep an eye out for them. This is an excellent list of healthy meals. I will have to bookmark it. Great information on this lens! Great recipes, I pin it to have it handy. Blessings. Mmm, those fettucine with mushroom wine sauce look absolutely delicious! Will definitely try them. 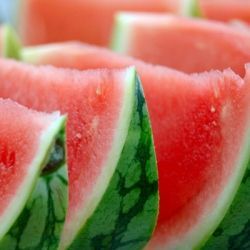 I found many other interesting recipes, and some good ideas too. Thank you for sharing. Oh wow, what a treasure trove of healthy but delicious recipes! Thank you so much for these. Excellent recipes! I'm always searching for tasty, healthy recipes. Blessed and liked. Great recipes and I love the videos! This is very valuable info for a Mama with 5 kids! :) Thanks for sharing! 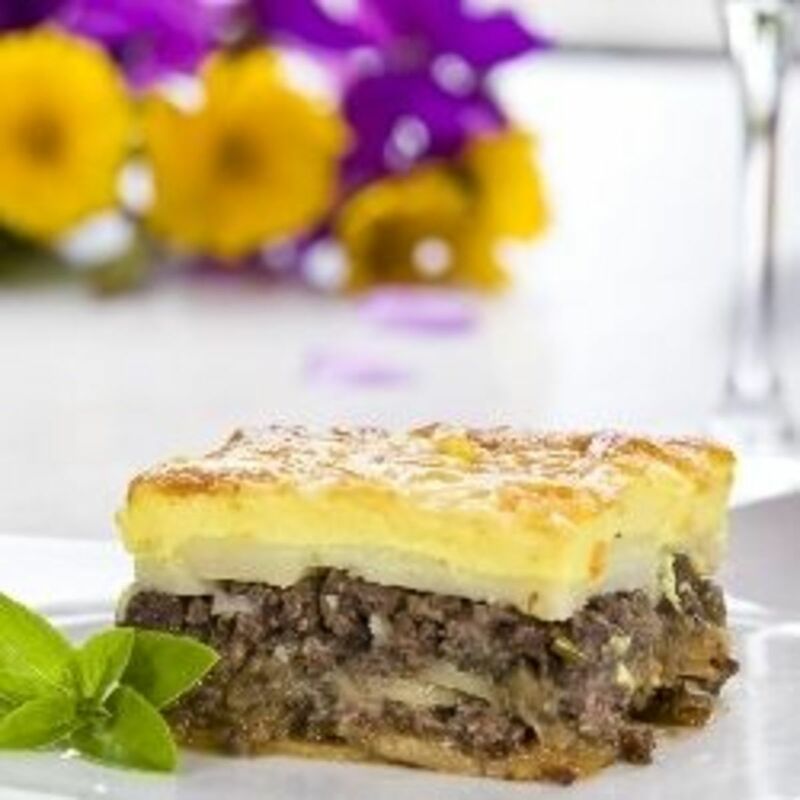 Fabulous lens with great recipes. The only thing I would change is in the smoothie. Use plain yogurt with all of the natural bacteria instead of the vanilla yogurt since the recipe already calls for vanilla and honey. I think you have done a wonderful job! I have pinned you and am leaving you with an *Angel Blessing* and adding this lens to My Squid Angel Blessings 2012 in the "Food &amp; Cooking Â» Recipes" neighborhood. @Auntiekatkat: Thank you so much. @verkeerd: Thanks so much for your support! This is a valuable lens, I've got to try your recipes! Thanks! @anonymous: Thanks for all the support! If anything is ever confusing or seems difficult, please let me know. After all, we're aiming for "simple" here! Really a nice well thought out lens! Thanks Linda and Sami. Let me know if there's anything in particular you'd really like to see here. Always looking for new ideas. I just started looking for healthy recipes. I would like to say thanks for the great information you have provided. Thumbs up and favorited. These all sound wonderful, I have got to try some and will recommend them to my new friend Kipsy!